The action continues on both land, sea, and air as the explosive engagements of late 1941 conclude. Operation Typhoon drives on to its high water mark as the tides of war reach the embattled city of Moscow, and the fate of Sergei Kirov is revealed. In the Pacific, as Japanese planes begin their attack on Pearl Harbor, Halsey’s ‘missing carriers’ find themselves in a perfect location to launch a devastating counterattack against the Kido Butai. Can they prevail, or at least intervene to prevent the great disaster that Pearl Harbor became? Or will their presence there, badly outnumbered by the Japanese carriers, merely assure the complete destruction of the American fleet? 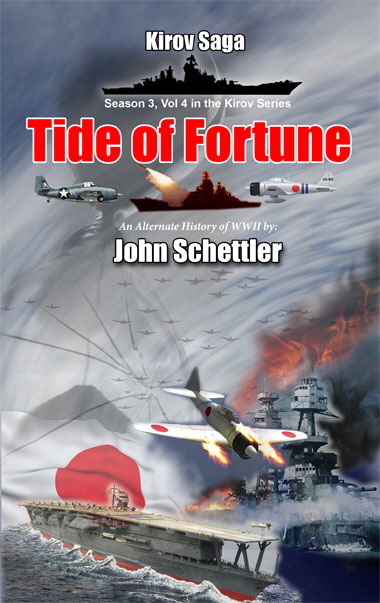 Days later, a lost convoy bound for the Philippines meets an unexpected enemy, and a pair of most unusual ships rush to the scene, finding a battle that soon involves ships from five nations. Further east, Ivan Volkov has planned a third massive attack on the strategic hamlet of Ilanskiy, where Captain Karpov aboard Tunguska is now thrust into the crucible of war. As the desperate fight is joined, his elder brother races south aboard Kirov with a message of retribution and warning to Imperial Japan. In the Atlantic, the Axis fleet, now based in Gibraltar and Casablanca, begins a most unexpected attack. Admirals Tovey and Volsky must now join together with Argos Fire to face the storm at sea, and a tragic loss hints at yet another level of mystery surrounding Admiral Tovey’s Key.